Do you frequently have negative thoughts? Do you constantly question your worth or sabotage your own happiness and success and wonder why? If so, your inner chimp might be to blame. Lost? Don’t be. 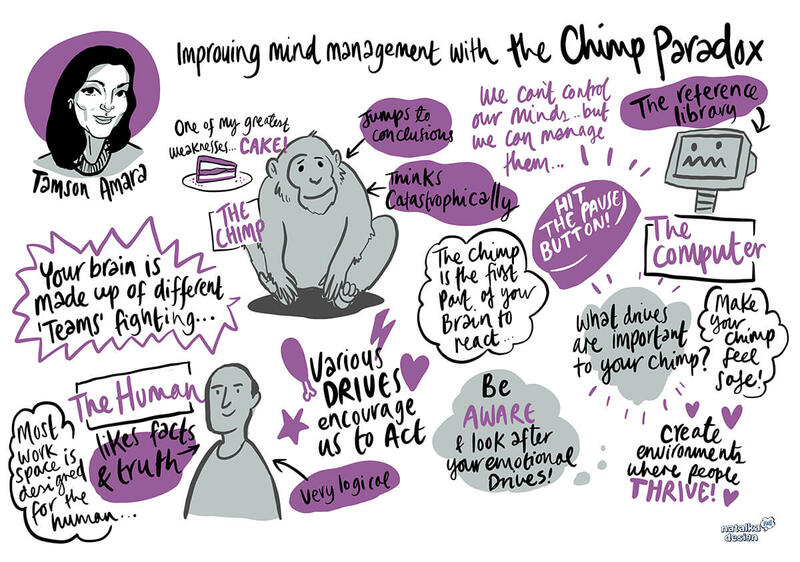 According to PUSH coach and speaker Tamson Amara, who helps teams and leaders create environments in which people thrive, we all have an inner chimp. It is an emotional thinker that is led by feelings and impressions and although it cannot be controlled, it can be managed. Speaking at last months recent inaugural ‘Starting The Conversation’ breakfast – an event which showcased the way employers could support mental health in the workplace and build resilience in teams – Tamson enlightened attendees about the mind management model known as The Chimp Paradox from the remarkable Professor Steve Peters. The framework is designed to help us recognise how our mind is working, understand and manage our emotions and thoughts and equip us with the skills to deal with anxiety, build confidence and choose how we feel. It does this by viewing the human brain as three separate teams: the human (which interprets facts and uses logical thinking), the chimp (an emotional thinker) and the computer (the part of the brain that is programmed by the human and the chimp and runs these programmes automatically). Tamson, who trained under Professor Steve Peters, author of The Chimp Paradox, claims the skill in working the model is to understand the nature of the chimp, what is most important to the human and what programmes are in the computer that are either helping or hindering us from being our best and bringing out the best in others. Using the analogy of a hot-desk working environment, she cites the example of an employee who dislikes sitting under the air conditioning vent. Anxious about securing the ‘warm’ desk, the employee decides to arrive at the office at least half an hour – 45 minutes before the rest of his/her colleagues but not only is the staff member lengthening their day, they are also worrying about desk availability which could negatively impact their wellbeing over time. A hot desk policy – which allows for bookings – could allow chimps to feel more settled because there is more predictability and flexibility in the system. Your chimp is the first to react – and it is driven by emotive thinking. Pausing for a moment will help you to respond with perspective. You cannot control your mind but you can learn to manage it by increasing your self-awareness and developing your psychological skills. When feelings of panic, anxiety or fogginess arise, ask yourself which of my emotional needs need reassurance of perspective? Bottling up unhelpful thoughts can lead to health and relationship problems. Talk to a close friend or use a journal to write down your frustration and worries to clear your mind. When we live with perspective and plan for our emotional needs and those of others, we can learn to ride the waves in a calm and open way. Read more about how PUSH is tackling workplace mental health head-on with ‘Starting the Conversation on Mental Health in the Workplace and Building Resilience in Teams’ and PUSH facilitator and BBC Futures Editor Mathew Shaw tells us 6 ways employers can support good mental health.